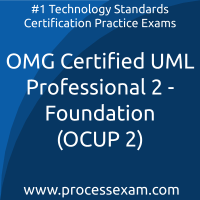 Are you looking to achieve OMG certification and become a certified professional? We have good news for you; we have a solution, which can help you clear the OMG certification. We are here to assist you in achieving your goal by using our online certification practice exam platform. With tons of experience in the field of Technology Standards, our team of expert has designed these practice exams which simulate actual OMG certification exam environment. We recommend you to use our online OMG certification practice exams for your test preparation. These practice exams will help you to validate your knowledge and identify the areas which need improvement, it will make you familiar with OMG certification exam pattern and question format. The OMG certification enhance your skills and knowledge by exposing you to real-time business scenarios and case studies. The most important value OMG certification adds into your career is the endorsement from the OMG that says you know what you are doing. I was not alone practicing on the OMG-OCEB2-FUND100 mock tests. There were many like me and we were all connected online together and became the rock-solid support that is required to sail through the OMG Certified Expert in BPM 2 - Fundamental certificate exam. With OMG-OCEB2-FUND100 mock tests premium membership, i got access to unlimited attempts and also personalized result book to track my progress. This decides how i should move forward in the attempts and also formed a strategy. 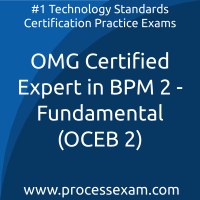 Passing the OMG Certified Expert in BPM 2 - Fundamental certificate exam became very easy for me.